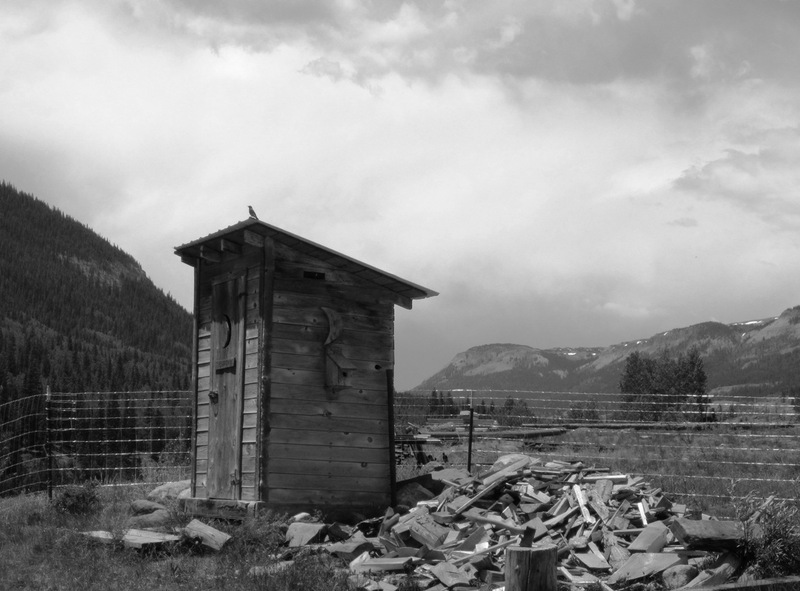 Within a stone’s toss from our Little Cabin is the outhouse, a close and convenient distance from the front door of a cabin without indoor plumbing. On the east side of that outhouse, like a small wooden box perched on the bluff over the river with a view as spectacular as any you could dream up, is a bluebird house. Before we moved back down to this cabin for the season, renting out the house we built and called home once again to a series of grateful tourists, the bluebirds moved in. They were disturbed when that outhouse began receiving regular use, but determined to stay put. The couple remained, the eggs have hatched, tiny squeaking chirps amuse us as we sit silently on the throne on the other side of the old weathered wood wall, and from our table in the cabin we watch the proud parents busy throughout the day catching bugs to feed their growing brood. The power of a dream. And the emptiness to be without. Even before he was born, it never occurred to me Forrest would not receive a full tuition scholarship. I know that sounds crazy. Much of what I do and believe does. But I’ve not only believed it, I’ve worked towards it for the past eighteen years. I saw no reason why it could not be. And took a lot of steps along the way to make it happen. And then so did Forrest. And ultimately, he made it happen. He’s learning to dream, and seeing how dreaming is the first step to creating. Now I find myself uncertain of my dreams. They are distant and vague. The clear images which have guided me into these often crazy situations throughout my life currently are too murky to steer me clearly. I’ve been beaten down after the past eight years of plans torched in spite of my efforts. I’m not sure if I blame bad luck, bad relations, or bad choices. Probably a combination of all three. And still I have to realize that success or failure, both are mine. Now I falter. My resolve is weakened. I question myself. It is one thing to be a dreamer, I remind Forrest, but I have and will always strive to be one who works towards and makes my dreams into reality. A doer, he says, not just a talker. Yes, I say. But I don’t want to just be empty words. I want to be actions. Living proof. How do I get myself to dream again when right now it seems my days are consumed putting out fires as they arise? Moving out, moving in, moving far away, guests arriving, horse training, college paperwork, business, ditch work, completing the subdivision… Even the simple things like finding a place to take a shower after a day of hard work. I tackle the list in order of priority. Dreaming is not at the top of the list, and the list is in a cycle of growth. Wind stirs the fire. The additional energy needed to build, and rebuild, has been minimal. I’m trying to catch up with the fires, jump the line and run free and clear. But I’m done being burned and consumed. My priorities are no longer this business, my guests (yes, my calling in life of providing a clean and comfortable short term get-away for a bunch of every changing tourist is complete – I can check that one off my list). It’s time to close one book and begin a new one. Scary, exciting, wild and uncertain. The wind picks up. It’s bringing rain clouds this time. A storm blows in. The embers sizzle and thin trails of smoke wisp up as the rain pours down. In the midst of the storm over the Rio, I feel my dreams stirring like dormant seeds in a parched land. Soak, expand, and allow the dreams to swell. Something is taking shape. Completing a subdivision? What have we missed? We’ll be excited to hear what your dreams bring forth! And, aren’t we all proud of Forrest! As for the subdivision, after four years on the market and realizing the reality of running the guest ranch is not something anyone was going to buy, we’ve decided to subdivide and sell the individual cabins – to the happiness of many, including those who can now own a piece of paradise up here, but I’m afraid also to the dismay of a few disgruntled guests who have been not so secrectly glad we haven’t been able to sell and move on yet. As for my dreams… they are stuck… Ever happen to you, too? I need to open my eyes inward and take a look at them myself once again. Get a clear picture, then work like heck to make it happen. Hope, dreams, ambition…it’s what keeps us going! Although I admit I have more hopes and dreams than ambition. You’ll find yours again soon and be on your way. Ah… except I feel that ambition stirring, Karen… and it’s pretty strong, too. dreams stuck here too… not gone, not growing, not dead, just stuck. and the sense that i need to re-vision, choose with even more clarity and faith floods my thoughts as i put one foot, then the other. the tide of demand doesn’t seem to want my dreams to thrive. but, they gotta… big hugs to you, sister. Ruth, I’ve heard people say “it was meant to be” when things are really easy and just fall into place. But don’t forget, it’s those things that did not come easy, that we had to struggle for, that sometimes are more rewarding, more real, and the sweeter to claim as ours. Besides, without times in the dark holes, how could we see our dreams? Don’t we need those dark times and space and places to enrich the light within? Shallow waters get stagnant in the heat of mid day. You’re deep, Ruth. Dive into the depths. That’s where the best of the dreams are hiding. I’ll see you there.